Gammel Kongevej (literally "Old King's Road) is the principal shopping street of Frederiksberg in Copenhagen, Denmark. Running roughly parallel to Frederiksberg Allé and Vesterbrogade, it extends from Vesterport station at the southern end of The Lakes and continues for some 1.8 km west to Frederiksberg City Hall Square where it continues as Smallegade. In the opposite end, Jernbanegade connects it to Copenhagen City Hall Square. Gammel Kongevej is one of the oldest road sections in Frederiksberg, originally providing a direct connection between Copenhagen's Western City Gate and the village of Solbjerg. From there the it continued past the Damhus Lake towards Roskilde, giving rise to the name Roskildegaden ("The Roskilde Street"), which is seen in some documents from the beginning of the 17th century. The road was improved by Christian IV in the 1620s. The name Kongevejen (English: King's Road) emerged about a generation later when it became the principal road to Ny Amager (New Amager), as Frederiksberg was then called, where the king had several properties. The name of the road changed to Gammel Kongevej after a new Route de Roie, Frederiksberg Allé, opened in 1705. The road passed through open countryside with only a few scattered country houses until the mid-19th century when Copenhagen's fortifications were decommissioned and the city was allowed to develop freely. A number of new country houses were built along the rad but most of them were replaced by multi-story apartment buildings with shops in the ground floors in the 1880s and 1890s. P. Andersen opened the Svanholm Brewery at No. 64 in 1853. It was merged with several other breweries to form The United Breweries in 1891 and most of its buildings were replaced by a machine factory and iron factory. Part of the site was cleared in 1904–05 to make way for the new street Prinsesse Maries Allé. The rest of the industrial plant was replaced by the cinema complex Kinopalæet in 1918. Gammel Kongevej mainly catered to the middle upper middle classes. The area next to the iron foundry was home to a small working-class neighbourhood with an infamous reputation. In the 1950s, Jørn Utzon, architect of the Sydney Opera House, drafted a project for the area which was never built. It consisted of tower blocks in a green space inspired by Japanese gardens. Just off Gammel Kongevej, between the streets H.C. Ørsteds Vej and Bülowsvej, is a small enclave which has been described as Denmark's first urban neighbourhood of single-family detached homes. It consists of the side streets Uraniavej and Lindevej. The area around Sankt Jørgens Sø is home to a cluster of modern buildings which include the Tycho Brahe Planetarium and two highrises, Copenhagen Scandic Hotel and the 18-storey Codan Building. 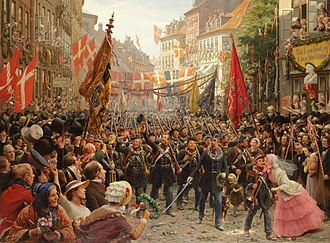 ^ a b "Hvordan Ny Kongevej blev til Gammel Kongevej" (in Danish). Berlingske. Retrieved 2014-06-10. ^ a b c d "Gasværket". Frederiksberg Allé. Archived from the original on 2012-04-23. Retrieved 2013-04-13. 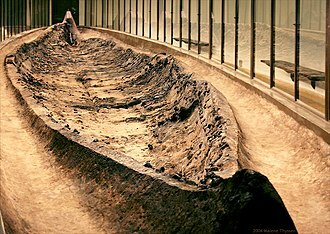 ^ "Gårdinteriør fra Bryggeriet Svanholm Gammel Kongevej 68 set fra gården nærmest Vodroffsvej" (in Danish). Museum of Copenhagen. Retrieved 2014-06-10. Wikimedia Commons has media related to Gammel Kongevej. Søndre Fasanvej begins at Valby Langgade and continues along the western margin of Søndermarken and Frederiksberg Gardens to Smallegade, passing Roskildevej on the way. It continues as Nordre Fasanvej, passing several major arteries, including Nylandsvej, Godthåbsvej, Borups Allé and Hillerødgade, the oldest part of Søndre Fasanvej, north of Roskildevej, was established in 1682 as an access road to the royal pheasantry behind Frederiksberg Gardens. The road was extended northwards to Smallegade. The southern part of present day Søndre Fasanvej, between Valby Langgade and Roskildevej, was created in about 1870 as a driveway to a cluster of nuerseries. It was first known as Bag Søndermarken but was incorporated in Søndre Fasanvej in about 1900, Nordre Fasanvej was established between 1883 and 1908 as a direct extension of Søndre Fasanvej as the old part of the street was now called. A new Frederiksberg Hospital was built at the street in 1903, the west side of Søndre Fasanvej, opposite the big parks, is dominated by areas of Single-family detached home, apartment buildings from the 1880s. A single-family detached home, called a single-detached dwelling, single-family residence or separate house is a free-standing residential building. It is defined in opposition to a residential dwelling. The definition of this type of house may vary between legal jurisdictions or statistical agencies and it does exclude, any short-term accommodation, large-scale rental accommodation, or condominia. 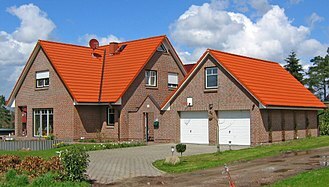 Garages can be found on most lots, houses with an attached front entry garage that is closer to the street than any other part of the house is often derisively called a snout house. It is important to note that In the United States, that the term Single Family Residence specifically refers to the not the occupants. Historically, Homeowners Associations have used the term to limit non-nuclear families, these types of HOA policies are subject to Fair Housing Lawsuits, heavy penalties, and possibly personal liability for board members. Terms corresponding to single-family detached home in common use are single-family home, single-detached dwelling, detached house, in the United Kingdom, the term single-family home is almost unknown, except through Internet exposure to U. S. media. In pre-industrial societies most people live in multi-family dwelling for most of their lives and this type of arrangement saves on the effort and materials used for construction and, in colder climates, heating. If people had to move to a new place or were wealthy enough, they could build or buy a home for their own family, of course and this has produced a cultural preference in settler societies for privacy and space. A countervailing trend has been industrialization and urbanization, which as seen more and more people around the world move into apartment blocks. Single-family homes are now common in rural and suburban and even urban areas across the New World and Europe. 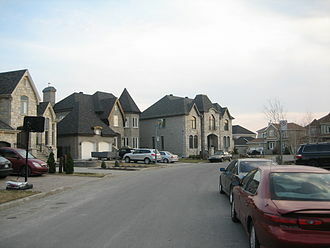 They are most common in low-density, high-income regions, for example, in Canada according to the 2006 Census 55. 3% of the population lived single-detached houses but this varied substantially by region. In the Ville of Montreal, Canadas second most populous municipality, only 7. 5% of the lived in a single-detached house, while in the city of Calgary. Flintholm is a modern neighbourhood in the Frederiksberg district of Copenhagen, Denmark. Located just south of Flintholm station, on the border with Vanløse, the neighborhood covers an area of about 10 hectares and consists of a mixture of housing, offices and several minor green spaces. The only surviving building from the gasworks, The Yellow Villa and it was named after Jacob Nielsen Flindt, a farmer, who acquired the property in the 1790s. The area remained open countryside until the 1890s when it was acquired by the City and designated for municipal utility, frederiksbergs second gasworks opened at 76 Finsensvej in 1895 and was in 1908 joined by Finsen Power Station down the road. Flintholm House was adapted for use as an infectious decease hospital and it consisted of 12 beds in the house and 40 beds in two tent wings. It was in use in 1917, when Frederiksberg was hit by an outbreak of scarlet fever, up through the century, Frederiksberg Gasworks saw several expansions, especially in the years after World War II, before it was closed down in 1964. Diakonissestiftelsen was founded in 1866 at the initiative of Crown Princess Louise, consort of the king Christian IX. A building in Smallegade near their current site, contained a small hospital and their current site was inaugurated in 1876. Their hospital in Smallegade closed in 1880, the Deaconesses premises comprise 33,000 square meters of buildings on a four hectares of land. The original main building is a long three-winged which runs along Peter Bange Vej. It was designed by Hans Jørgen Holm in a Neo-Gothic style inspired by medieval monasteries, the complex has been expanded by Gotfred Tvede and Harald Gad. To the rear of the complex, facing the garden, is a couple of wash houses. 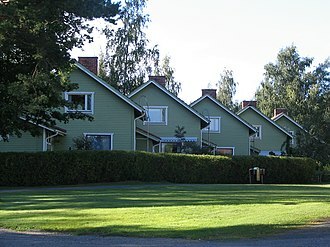 Other buildings in the grounds include Søster Sophies Minde, located on Sønder Fasanvej and it was built in the 1950s to provide residences for retired Deaconess sisters. Diakonissestiftelsen owns the house Marthabo on the side of Peter Bangsvej which houses a kindergarten. The building is from 1885 and was designed by C, a masterplan competition for the area was settled in April 2012 with two interdisciplinary teams led by Tegnestuen Vandkunsten and Cubo Arkitekter as joint winners.